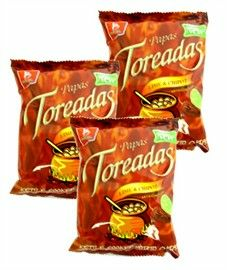 Barcel's Papas Toreadas Limon-Chipotle are delicious kettle cooked textured potato chips. Handed down from generation to generation, Chiles Toreados are created by searing fresh chiles on a blistering grill to intensify their heat. Barcel has captured their essence with a new, thin-cut, fiery Chipotle flavor, crispiness and crunch with hint of lemon and the delicious smoky heat and flavor of the chipotle pepper in every chip you eat. Excite your taste buds with Toreadas, a new tradition from Barcel. Try them now!. Serving Suggestions: Eat them by themselves, with a sandwich, burger, hot dog etc! Enjoy as a snack watching your favorite movie or show! May contain Soy, Milk and FD&C Yellow No. 5. Ingredients: Potatoes, Hydrogenated Soybean and/or Canola, Palm and/or Sunflower Oil, Seasoning [Salt, Maltodextrin, Natural Flavors, Artificial Flavors, Tomato Powder, Guajillo Chili Pepper, Citric Acid, Onion Powder, Monosodium Glutamate, Artificial Colors (FD&C Yellow No. 6 Lake, FD&C Yellow No. 40 Lake and FD&C Yellow No. 2 Lake), Chile Extract, Partially Hydrogenated Soybean Oil, Sodium Diacetate, Sodium Inosinate, Sodium Guanylate, BHA, Calcium Silicate and Silicon Dioxide (Less than 2% as Anticaking agent)] and Contains 2% or less of the following antioxidants (BHT and/or TBHQ and/or Propylene Glycol and/or BHA). Barcel's Papas Toreadas son unas deliciosas papas con sabor limon-chipotle. Pasado de generaci�n en generaci�n Chiles Toreados obtienen su sabor al ser asados en brasas calientes para intensificar su sabor ardiente. Barcel a capturado su esencia con un nuevo picoso, amargo y ardiente sabor a limon-Chipotle. Tori-antojate con su sabor!! Puede contener soya y Leche. Ingredientes: Papas, Aceite de Soya y/o canola, Palma y/o de Girasol hidrogenado, Sazonadores [Sal, Maltodextrina, Sabores Naturales, Sabores Artificiales, Tomate en polvo, Chile Guajillo, Acido Citrico, Cebolla en Polvo, Glutamato Monosodico, Colores Artificiales (FD&C Amarillo 6 Laca, FD&C Amarillo 40 Laca y FD&C Amarillo 2 Laca), Extracto de chile, Aceite parcialmente hidrogenado de Soya, Diacetato de Sodio, Inosinato de Sodio, Guanilato de Sodio, BHA, Silicato de Calcio y Dioxido de Silicio (Menos del 2% como Antiaglutinante)] y contiene 2% o menos de los siguientes antioxidantes (BHT y/o TBHQ y/o propilenglicol y/o BHA). I've had them all (Lay's, Sabritas, Adobadas, Toreadas, etc.) and these flavor of Toreadas Lime and Chipotle are the very best.